General information: Loose Henry VIII theme due to the proximity to Nonsuch Park. Beer been in good condition lately,beer festival beers been better than last few festivals.Staff are excellent,although you don't see the invisible manager at night times.HE NEEDS TO INFORM ALL THE STAFF THAT PUNTERS SHOULD GET AT LEAST 20 MINUTES DRINKING UP TIME,NOT 5/10 MINUTES THAT SEEMS TO BE THE CASE EXCEPT WHEN THE EASTERN EUROPEAN GIRL SHUTS.As for the bouncer at weekend,stop pestering the punters to drink up at 12.55AM and wanting us out by 1.05AM!THIS PUB ALWAYS GAVE 30 MINUTES DRINKING UP FOR MANY YEARS,20 MINS IS FAIR! 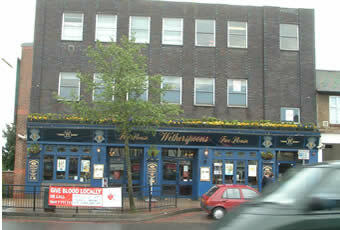 Visited a few times lately,enjoyed pints of Adnams Ghostship,Trueman Swift,Exmoor gold to name a few all in good order.Staff and service great.New manager hasn't been seen on night shifts but needs to sort out the drinking up time as it getting shorter and shorter,20 mins is fair!Dont appreciate bouncers coming round at 11.55,5 mins before last orders telling us to drink up,making us leave at 12.04 so they can get a McDonalds and their bus,this was on Wednesday night after England semi final.FRIDAY AND SATURDAY THE DOOR STAFF NEED TO BE TOLD TO GIVE THE CUSTOMERS 15/20 MINS DRINKING UP AND STOP COMING ROUND EVERY MINUTE TO DRINK UP!Know a few customers who go elsewhere because they are on! New manager in last few months.Beer choice not as good and that's why the pint counter gone down by 300 a week!Beer quality a bit hit and miss too and since the sparklers have been used measures down!The table rearrangement I don't like,would have to be Twiggy to get into the space provided! On the plus side all the great staff are still here,hard workers and all great with customer service,thanks! The previous manager is a hard act to follow,but stick with,oakham,surrey hills,ELB,exmoor,cotleigh and drinkers will return! By far the best spoons in the area.beer quality amazing,enjoyed some great beers from loddons,surrey hills,ELB,trumans, to name just a few.manager and staff here are fantastic. Excellent beer quality,whoever is doing the cellar well done. Use this place weekends always seem to have good staff that work hard, apart from the S/African fella not the sharpest behind the bar. Tried the food a few times which was great.